VxRail 4.7.110 – vCenter, now with VxRail Manager inside! Today is a great day! We released VxRail 4.7.100 code, which is based on vSphere 6.7 EP6, but more importantly, it’s also the first version that supports the vCenter plugin. The plugin will allow customers to administer their VxRail clusters without leaving vCenter. In order to first get all the updates, I had to upgrade my cluster from 4.7.001 to 4.7.100. The upgrade process is straight forward, just like any other upgrade. The upgrade itself wasn’t out of the ordinary when compared to other VxRail upgrades. As always, the upgrade of VxRail is complete from a hardware and software perspective. Looking at the components in the package, it looks like there are updates for BIOS, PTAgent, and a few other components. When the upgrade is complete, the VxRail Manger plugin will automatically be installed in your vCenter. In addition, if you try to log directly into the VxRail Manager VM, you will be directed back to the HTML5 vCenter interface. In order to make sure things are uniform, we’ve disabled the ability to log into the VxRail Manager VM directly. When we shift to the plugin, no functionality is lost, it’s more about making it streamlined and accessible from a single console. This will not only help those customers with a single VxRail, but those with multiple clusters in external vCenters will see a tremendous benefit. After the upgrade is completed, you will see an alert across the top of vCenter that the plugin has been installed and that you need to refresh your browser. After the browser is refreshed, you’ll see the plugin in a few locations. The first thing you’ll see if you click on “Menu” at the top, there will be a “VxRail” option below “vRealize Operations”. By choosing that option, you’ll see the VxRail system and this display is the equivalent of the “Dashboard” from the standalone VxRail Manager instance. Here, you can see all the same information – system health, support options, VxRail community, etc. The next set of screens to look at are when you select the cluster and then choose “Monitor”. Here you will see a link and launch to the VxRail Manager physical view as well as information on the last configuration data sent if you have SRS (dial home) enabled. The reason that physical view is a link and launch is because the vCenter SDK doesn’t allow us to display the physical view pictures like we did in VxRail Manager. This is also the case for a few other views from VxRail Manager. The bulk of the VxRail Manager plugin resides in the configuration section of vCenter when you’ve selected the cluster. The first one in the list is “System”. In this view, this is where you’ll see the equivalent of the Config view from VxRail Manager. Here you can see information about the installed version, and this is also the view you’d go to for an upgrade. One thing that’s new with VxRail 4.7.100 is customers can now add their own nodes without a PS requirement. In order to do this, you’d select the cluster and choose “configure” and under the VxRail option, there’s now an “Add VxRail Hosts” option. This workflow will walk customers through adding new nodes to their cluster as easily as possible. Stay tuned for a future walk through on that. There are many other views that carry over into the configuration tab of the cluster. Those include the Market (currently link and launch), Support, Networking, Health Monitoring and Troubleshooting. 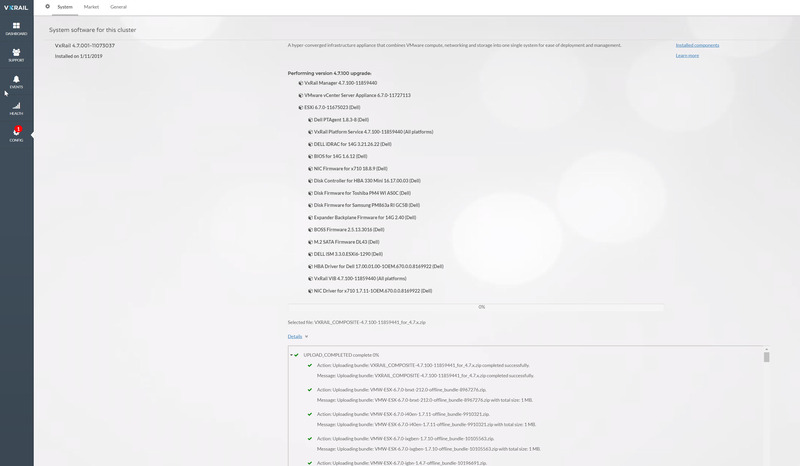 As you can see, these screens are where you would go to enable/disable health monitoring, make sure your support account is set up correctly, access the VxRail Market and setup VxRail Manager to access the internet through a proxy server. Another option there is to create the log bundles for VxRail in the “Troubleshooting” menu option. We’ve changed the options for the log bundles now as well. Now you can choose to grab logs from VxRail Manager, vCenter, ESXi, iDRAC and/or the PTAgent. This will help reduce the size of the logs, but also make sure you’re grabbing the relevant logs for your case. Another new item in the plugin is the ability to change the IP address and/or hostname of a VxRail node. You’ve always been able to achieve this in the past, but it was a multi-step process that usually required support to assist with. Now in the configuration screen, if you select the “hosts” option, you can change both those values AND it’ll make sure to update the VxRail Manager database entries as required. This can be done by selecting the host and then clicking on “edit” above the list of hosts. As you can see, we’ve improved the ability to manage/administer a VxRail. In addition to the few new features above, there are 2 more I wanted to point out. First, you now have the ability to set up or edit the iDRAC IPs on the nodes through vCenter. If this is something you’d need to do, simply select the host, and then choose configure. Down at the bottom, you’ll see the VxRail options and the only choice there is “iDRAC Configuration”. Having this inside vCenter will help continue to make vCenter your management plane for all things VxRail. Now, the final option is something we’ve been doing for a while, but again, it’s something we’ve now opened up to our customers – the ability to remove a node, safely, from the cluster. If you want to remove a node, you simply right-click on the VxRail node and down at the bottom, there’s a VxRail menu and it’ll show “Remove VxRail Host”. This workflow will safely remove the node from the cluster. The one prerequisite here is that you will have to put the node into maintenance mode with the “full data migration option”. The VxRail plugin is something I know many have been waiting for. I plan to document a few other things in more detail, but wanted to provide a quick overview first. Remember, if you’re going to upgrade to 4.7.100, please ALWAYS check SolVe first to make sure you’re following a valid upgrade path. Thanks Jason. I will do my best to keep it up to date. Let me know if you’d like to see anything specifically discussed. When is the VCF support for VxRail coming? Chris, I can’t publicly publish dates, but “it’s coming” is definitely fair. If you’d like more info, reach out to your Dell EMC account team and ask them to engage the VxSEALs and we can talk more under NDA. Great post Jeremy, easy to understand. This is a powerful plugin. One question I have is around what vCenter user privileges are required in order for a vCenter user to be able to use the VxRail plugin? Is it a single Administrative privilege or is there a read-only type privilege also? I’ll draft up a post to cover this. There are some different options here. Great, look forward to it Jeremy, thanks! can this update be applied to any vxRail platform or just some specific models? There is a great discourse regarding environment migration with ESXi Standalone and cluster vspheres with external vcenters. Has anything changed about that? Can we migrate environments with external vCenter with cluster and standalone host into vxRail? In my case, we chose to use Internal vCenter, for a recommendation from Dell for centralized management purposes. Another doubt, I read that once defined that we will use the Internal vCenter, we can not change to an External vCenter. Does this change with this new version? Or even migrate VMs from an external vCenter to my vxRail Internal vCenter. This is terrible! Whose idea was it to disable direct access to the VxRail Manager and force people to use a vCenter plugin? One of the _advantages_ of VxRail Manager was that I could manage my cluster independent of vCenter, which can be unstable. Case in point: I just upgraded to V.7.110 and the plugin didn’t fully load. There is no “System” tab. The only options I have are “Appliances” and “Last Configuration Data Sent.” Where do I go to see whether my upgrade fully took? Where do I go for errors? Nowhere, apparently, since you’ve removed that feature. How am I supposed to monitor my upgrade while it is upgrading vCenter itself? I guess I can’t. What should have been a nice, easy upgrade just turned into a support ticket because of the arrogance of the developers who not only insisted on fixing something that wasn’t broken but forced everyone to go along with it. You’ve removed one of the critical features that drove our adopting VxRail in the first place.